Welcome to our regular recipe column from local teacher and stand-up comedian Sarah Whitmore. In this installment, Sarah puts a fresh spin on an old favorite: The Hippie Salad. Every new year, we resolve to take better care of ourselves, exercise, and eat healthier. We get off to a respectable start in January—gym membership, pricey plastic/rubber style stretch clothing. A tiny slip in mid-February with Valentine’s Day—hey, dark chocolate is good for us! Once Lincoln’s birthday rolls up, most of us are back to tequila shots and donuts, 24/7. So, how can we keep our resolutions to do things like Eat More Salad? It all starts with looking the part—and a luscious salad dressing. Nothing makes a potluck table full of food look healthier than a male hippie setting down a dish of raw, cashew lasagna. He’s wearing indigo-dyed harem pants under his tool belt—a tool belt stocked with magic wands. This guy will lean in close to the food, then whip his dreadlocks over his head and into a man-bun. His dread-tips will, for sure, graze the fermented banana slaw. Why am I painting this picture? Because this is a man who makes good food choices BECAUSE he dressed the part. Do you think he woke up wanting to eat kelp? He didn’t. But once he slid into those loose-weave, burlap espadrilles, there was no turning back. Nobody eats a bacon double-grease burger in a floor-length, raw-wool smock and sandals. Will this highly fringed, asymmetrical, yak fiber sweater- net get me to eat more salads? Yes, it will. Just like my saggy, mustard-gray, all-hemp “sports” bra compels me to buy a post-yoga kombucha instead of Diet Coke. When you look at that guy in the harem pants, do you think, I wish my clavicles were as elegant and prominent as his? Well, go out and buy yourself a pair of billowy, billowy bloomers. You will feel drawn to sauerkrauts, kefir water, and salads. 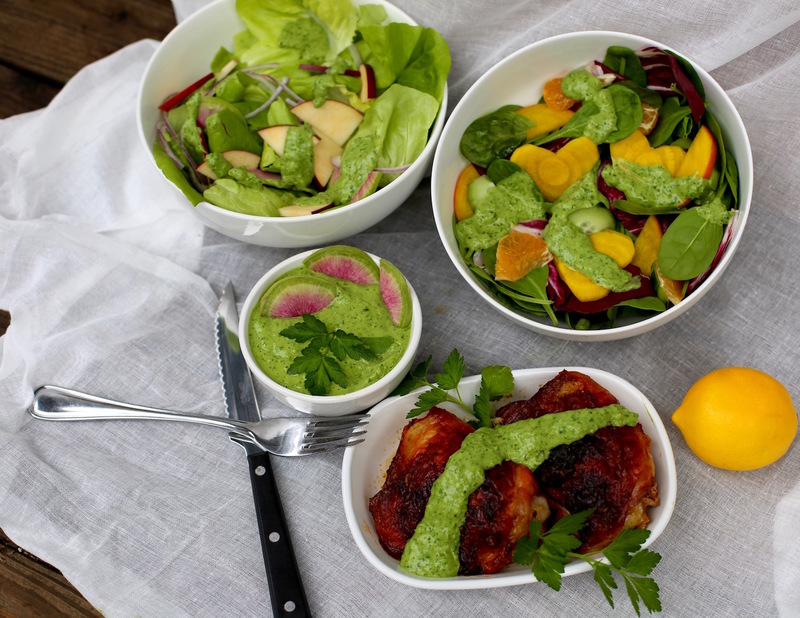 Another way to get yourself to eat more salads is to coat them in delicious salad sauces. 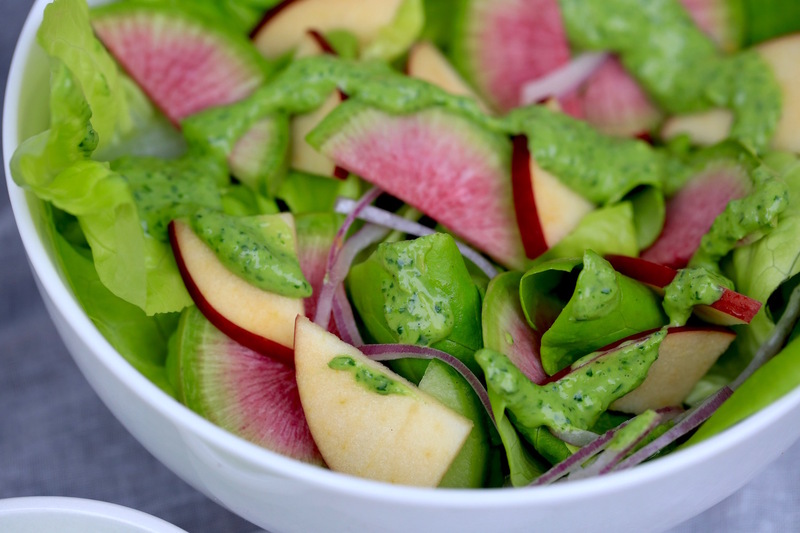 This simple, spring-green dressing makes even the healthiest foods irresistible. It’s yummy on a roast beef sandwich, but even better used to mask the crumbled dirt-clod texture of raw broccoli. This sauce is also heavenly drizzled over steamed veggies from your local farmers’ market (check the listings on pg. 44). By the way, everybody, stop making salads as if it’s the last salad ever to be made—using every vegetable in the universe. This creates a compost-style stew best served to a mob of rats. A decent salad requires only two to four ingredients and an amazing dressing. Add edible flowers. There is nothing more alpha-hippie than putting flowers in your food. It communicates: my salad is so beautiful it might be poisonous. Be sure to buy your flowers from a food vendor and not a florist. Try organic, unsprayed calendula, rose petals, or nasturtiums. People say they taste nutty and spicy. Or like arugula. Sarah Whitmore is a teacher, self- taught cook, and stand-up comedian who lives in Petaluma.